MUST HAVE FOR EVERY CASE – Why fill up your case with three tools when you can have one that does it all? This indispensable tool has been designed to fit comfortably in your hand and for use on virtually all electric and acoustic guitars, basses, banjos and mandolins. Also available in a bass guitar version. 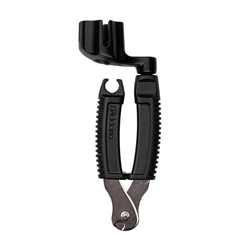 BUILT-IN STRING CUTTER – With the hardened steel clippers on the Pro-Winder string cutter you can cleanly cut through your old strings to remove them quicker and easier, and trim the excess off new strings after looping them through the tuning machines.